The OI partners with William & Mary’s Lyon G. Tyler Department of History and the American Studies Program to administer the OI Editorial Apprenticeship Program. The decades-long program introduces entering graduate students to the practices of scholarly publishing and historical editing. 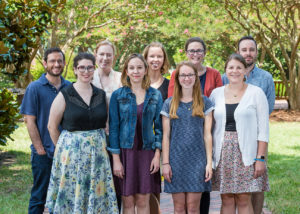 Each year, students participate in two weeks of full-time training in August, followed by part-time work during the academic year on OI books and the William and Mary Quarterly. Over the years, apprentices have gone on to careers in academic and trade publishing or documentary editing. Many have continued to pursue research and teaching, armed with a better understanding of historical documentation, writing, and publishing conventions. Both current and former editorial apprentices have the opportunity to apply for the Omohundro Institute’s Fellowships in Historical Editing. These annual fellowships allow students to build upon their editorial skills through continued work at the OI during William & Mary’s winter and summer breaks. Supported by funding from donors to the OI, the fellowships recognize exemplary work by apprentices as well as support the OI’s ability to maintain the high standards for which its publications are known.